One of the easiest ways to get a boatload of quality backlinks is to do podcast interviews. Almost every podcaster creates a show notes page for each podcast episode. This show notes page is like a mini blog post, and it has links to every website mentioned in that episode. If you get interviewed, then the host is going to add a link to your website on the show notes page. In addition to the link, you are going to add email subscribers and generate revenue. A podcast interview typically converts 5 to 10 times more sales than a guest post does with similar audience sizes. The reason for this is because of the intimacy between the host and their audience. By having you on their show, they are giving you a soaring endorsement delivered with their voice straight into the ears of every listener. 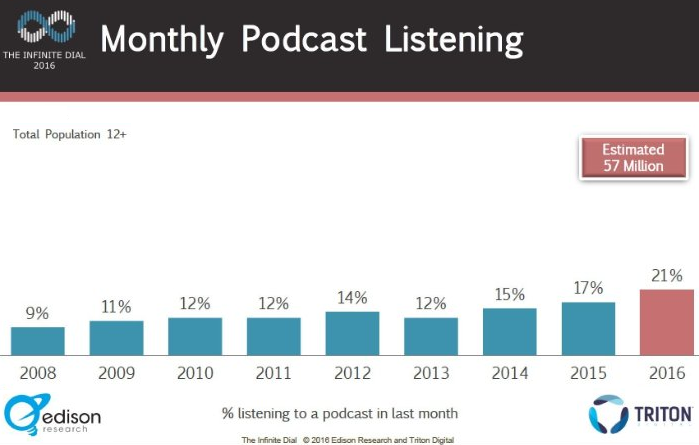 Podcasts have experienced a rebirth over the last three years. Today, over 57 million people listen to podcasts on a regular basis. Once you get the hang of it, a podcast interview is one of the easiest types of linkbuilding tactics to execute. It is like having a 30 minute phone call with a friend that looks up to you. As with anything, the secret to being successful is using a proven process. There are two great ways to find prospective podcast shows to go after for an interview booking. The first is to identify experts in your niche or industry that have been interviewed on podcasts. If you are an avid podcast listener, then you have probably heard a couple of industry experts on past podcast episodes. Most of these experts will have already done the leg work for you. All you need to do is go to the podcast section on iTunes and do a search for their name. This will give you a list of every podcast that they have been interviewed on. 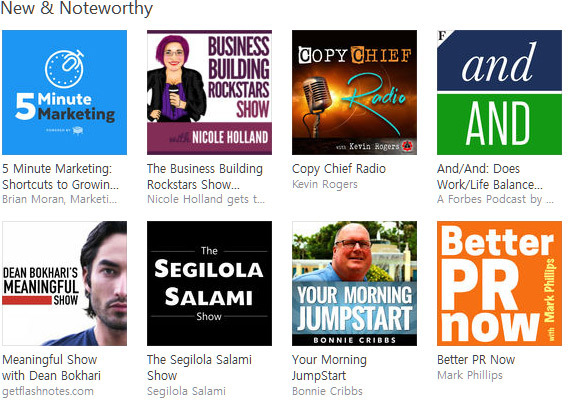 The second tactic is to go after podcasts in your category that are featured in the new and noteworthy section. These podcasts are just starting out and are always in need of more guests to be interviewed. Most of these hosts will say yes, and you will get booked for a date that is less than 60 days away. As you use these two tactics to identify interview opportunities, you will want to create a Google spreadsheet to build out a list of prospective podcasts to target. You should eliminate solo shows that do not interview guests. For example, my podcast is a solo show. I teach by myself and do not conduct interviews. In addition, you should trim any podcasts that are not consistently publishing new episodes. Your Google spreadsheet should have the iTunes url to their podcast, url to their website, domain authority of their website, email address, and Twitter handle. Here is a quick refresher on what domain authority is. It is a scoring method used to determine a domain’s ability to rank on Google and influence rankings with an outbound link. The scale is from 0 to 100. A backlink from any site with a domain authority over 30 is going to help push all of your posts up the Google rankings. Once you have all your podcasts in your spreadsheet, you will rank them by highest domain authority to lowest. Just because a website is below a domain authority 30 does not mean you should ignore them completely. They might be just starting out today, and next year their site could be well beyond a domain authority of 30. If you have never done an interview before, then it is best to get your feet wet with the podcasts that have little or no domain authority. 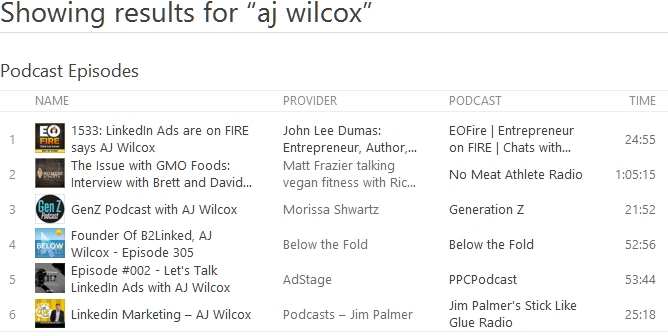 One of the shows that I am interested in being interviewed on is Entrepreneur on Fire. When I conduct a search through the tool Open Site Explorer, it reveals that the domain authority of EOFire.com is 67. For each prospective podcast, I recommend reading their about page and listening to their most popular episode. Their podcast page on iTunes will show you the popularity of every episode. The best practice is to spend more time preparing for the podcasts with higher domain authority websites. I usually spend 1 hour on high domain authority urls and 15 minutes on low domain authority urls. Once you have done your research on the podcast, then it is time to send out an email to the host. Here are the most important aspects of the introduction email. The best way to get a podcast host to open an email is to mention his podcast in the subject line. A few examples are.. It is not about you, and it is not about the host. It is all about what their audience will get out of hearing your interview. This should be your first three sentences, which will include the basic idea for the episode built around your interview. Here is a good example of an opening paragraph. I love your podcast, and my favorite episode so far was #23 on how to make serious money from your blog. I am very interested in coming on your podcast as a guest. I know I can deliver some major value to your audience. I grew my blog from zero to 1 million visitors in less than 18 months. I would be honored to share how I did it with your listener base. You want to let them know that you are going to be a great guest that will make everything as easy as possible. By giving them an actual episode title, you are letting them know that your interview is going to be a layup. Here are three titles that I have given out in the past. This lets them know that you took the time to research who they are. This conveys that you will be prepared for the interview and deliver great answers to every question they ask. Once you have booked your interview date and time, then you will need to plan out your preparation for the interview. Here are three ways I prepare for podcast interviews. Once you get the questions, write an outline for your answers so that you are not just winging it through the interview. After you have done a few interviews you will no longer need an outline because most of the questions will be similar. A tailored lead magnet is going to get 500% more visitors than just giving out your domain name. You will create a landing page with a custom url just for that podcast. 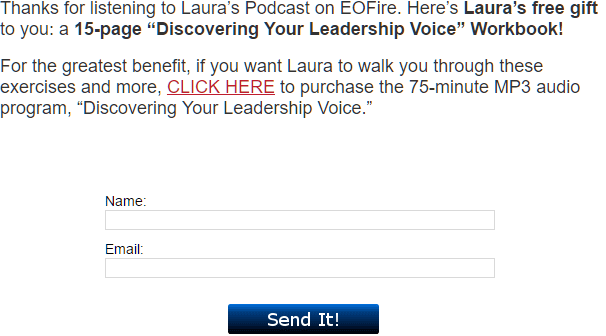 If I were to be on Entrepreneur On Fire, then my custom url would be TheBlogMillionaire.com/EOFire. You can take the landing page to the next level by making an introduction paragraph that mentions that specific podcast. You can repurpose this landing page for every podcast you appear on just by making a few small edits. Here is an example of a lead magnet from a recent guest on EOFire. Every podcast host that has interviewed me used Skype to record the interview. You will want to have Skype downloaded and ready to go before your first interview. You will also need a good microphone to help you sound like a rock star. The best low cost microphone is the Audio-Technica ATR2100, which you can get on Amazon for $55. If you do not have a quiet place in your house, then take your laptop into your closet. The clothes will absorb the echoes and make you sound like you are in a recording studio. Before I leave you, I want to equip you with a few tactics to make everyone remember who you are and what you said. People remember stories over everything else. We all have an origin story of how we got to where we are today. Usually it begins with frustration or hardship, and it is followed with perseverance along with a light bulb moment. Tell your story in every interview that you do. When you mention a strategy or technique, be sure to break it down with specific examples. It also helps to slow down your speaking pace by 30% when you begin breaking down tactics. If you fail to do this, then the listeners will get overwhelmed by all the new information. The best time to mention a lead magnet on a podcast episode is at the very end. This dramatically increases the chance that listeners will go to the show notes to get the url or directly type it in. If you follow my process, then you will be getting interviewed on a weekly basis. These interviews will lead to high quality backlinks, email subscribers, and actual sales. On top of that, you will be building friendships with some of the most influential people in your industry.